Most impact tools can be fitted with a number of interchangeable blades, depending on the cabling system you are using. The advantages of an impact tool are speed, ease of use, and consistency of termination. The tool will help you push each wire into the slot to make a permanent connection. 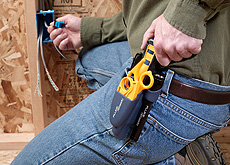 Advanced punchdown tools have a built-in blade that cuts off the excess wire after the wire is pushed onto the connector; others may require you to snip that off with the wire cutters, creating another step. Newer punchdown tools offer an ergonomic, easy-to-use handle and a built-in bed that helps hold the jack in place. Other new features include replaceable blade head for use with multiple jack types and wall-friendly designs to accommodate close-to-wall installations. To use an advanced punchdown tool, you first determine the wiring scheme is in place, strip the cable jacket, place the eight wires in their respective slots, and then insert the jack in the tool. After the trigger is pulled completely, the wires will be seated and cut for a solid termination. The handle is then released and the jack is removed from the tool. After visually verifying the proper termination, you follow the standard dress and press procedures. The combination of faster, more reliable terminations and less rework can cut the cost of this portion of the installation job by as much as 80%.
. Professional scissors are important for a fast, clean, and safe cut. You will need to cut cable and trim excess wires on every job. Some specialty tools offer a unique ergonomically-designed handle that leverages your power, providing 1 ½ times the cutting force with half the effort. The special “tail” on the handle that provides the added leverage also minimizes hand fatigue. Also, a cable stripper with an adjustable gauge is necessary for any cabling job. A high-quality cable stripper will guarantee fast, easy removal of outer insulation from all unshielded twisted pair, shielded twisted pair and multi-core cables. An adjustable depth gauge and a reference for checking the length to be stripped will ensure highly repeatable results and improve the quality of work. Using alternative methods like a pocket knife or scissor could result in stripping more cable sheath than necessary and damaging the cable itself. Other useful tools during cable installation include crimping pliers, cable splicing knives, can wrenches for access to telephone boxes and pedestals, voltage detectors for protection against hazardous voltages, modular crimpers for telephone plugs, and probe pics to check for loose or damaged connections.